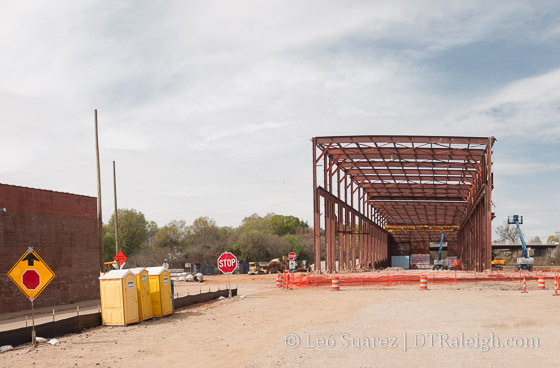 The future Raleigh Union Station has been stripped down to its steel bones. The renovation of the former warehouse building for Raleigh’s new train station is creating a flurry of activity at the south end of West Street in the Warehouse District. The new station is scheduled to open in 2017. Finally something to see in terms of progress! I didn’t realize that the building was going to be completely stripped to the its bare bones for the renovation. I know that technically this still counts as a renovation, but once any and all original character is removed, it’s essentially a new building. The steel ibeams being retained look about the same no matter how old they are. Oh well…the construction materials and techniques used to build this were essentially the same as modern buildings. Cheerio for progress. I also didn’t realize this. I ran past last Monday and saw this, and was like…Wow! I realize I’m in the minority here, but I personally have no love of giant brick rectangles. They can all go for all I care, so I’m not losing any sleep over that. Will there be any reuse of the bricks in the construction of Union Station, the plaza, or somewhere else in Raleigh? @CX, what a great idea! @Jeff, just to clarify my own POV on giant rectangles, they are definitely not all the same. For me, most of the Dillion warehouses lack historic character or architectural distinction. The ones I could care less about generally were built after WWII. Prior to then you have Art Deco from the 20’s and 30’s going back to Italianate stuff from the 1860’s through the 1890’s. Most of the say, tobacco warehouses in Durham are priceless to me. Also the materials (old growth trees used for beams e.g.) and building techniques (lap joints, strap iron ties e.g.) are difficult to recreate or not widely practiced. The viaduct building was built with the same materials and techniques that it’d be built with today. Raleigh of course has a dearth of warehouses I’d strongly advocate keeping for my stated reasons…the knitting mills, the HQ Raleigh building, the Five Star building are examples of what I think pass my litmus test. Anyway, I just want to be clear preservationists are not united behind any one view is my point and have different things that matter to them.